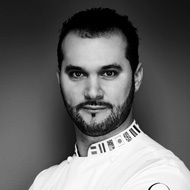 The Italian chef Davide Comaschi jumped to the international scene after winning in 2013 the World Chocolate Masters. He currently directs the Chocolate Academy in Milan, where he conveys that the survival of artisan pastry goes through the renovation and creation of products that offer a positive nutritional balance for both body and mind. In his creations always try to combine elements of Italian tradition with an innovative design and a clean and elegant presentation.